JayJay85 has assumed control of all development pertaining to the 6. All updates will continue to be posted from this topic from now on and will be coordinated with the rest of the Lexington Avenue development in the future. Uh...yeah...you should probably wait a few more...idk, months, before everyone else here actually upgrades, and brings up the issue of OpenBVE not working on Windows 8 before you make the tutorial...it only came out 20 minutes ago, and it already seems to have been getting a lot of negative reviews on my end. Anywho, everyone should already know about the compatibility mode (lol they can google it, duh), since it was a feature introduced way back in Windows Vista. The bigger problem was getting the original BVE's to work on the x64 based systems which eventually led to more people using OpenBVE, and since Windows 8 has a lot of features which are derived from Windows 7, only an update to the original OpenBVE source code should suffice to bump it up another compatibility level. 3D poles are completely unnecessary, for either version. Something like that would look a lot better in Trainz Railroad Simulator where detail is a big issue and the graphics are driven from computer resources and the video card. Keep in mind that making 3D poles(in other words, cylindrical objects) would create too many polygons when drawn out in Sketchup, for a program of this kind, and may alone just top the train's current poly count and lower frame rates significantly. This train is already high in quality and perfection, and even I can't ask for any more than that. All I have to say is make the lines that are actually complete a bit darker. But I like this way. Good job, Manny. 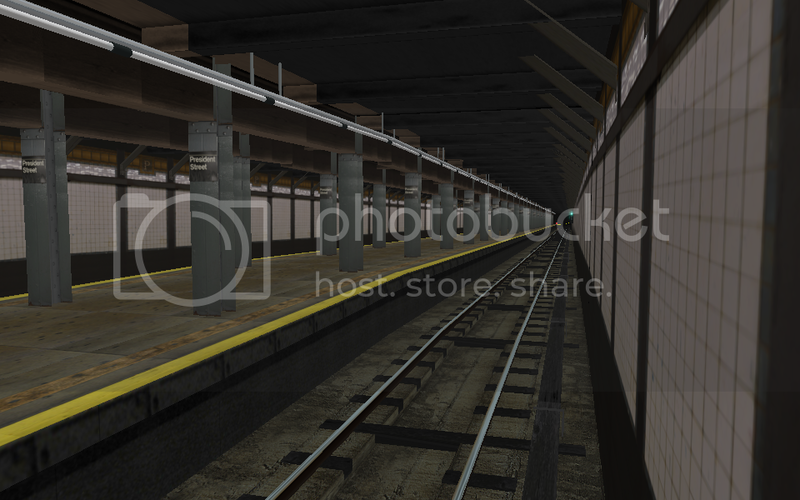 Always check the MTA Photos page, on Flickr. In the core city around Lower Manhattan, they were the hardest hit by the storm. Ever since AMD absorbed ATI it's been a completely different company, but the fact remains that OpenBVE was built to optimize its performance on the AMD processor, which was built for mostly gaming, rather than multimedia, like Intel. Besides, regardless of the graphics card or processor, the fact remains that OpenBVE draws all of its rendering capability directly from the GPU, whereas other simulators(and video games) are integrated to the system and utilize DirectX, and/or OpenGL, so it actually demands more than what you all think, but in the very weak areas where the system can't offer it. In order to improve capability and maximize development, this one hurdle must be overcome so that we expand the limits of our projects. Basic versions of the lines are not available here, but at b-v-e.info. Not sure if the links are still up, but you can look there for your answers. Newer versions are currently under development in collaboration with the BVEStation team. Check the NYCTA Projects section from time to time to check on progress. No, but I would advise either waiting for the full line to come out, or contributing with the link posted above.